Thanks for all the entries into last week's contest. A winner has been contacted. If you haven't had a chance, read the comments if you enjoy knitting books - lots of great recommendations. Mollie of Wild Olive has just reviewed my Craftsy Stitch It with Wool Class. 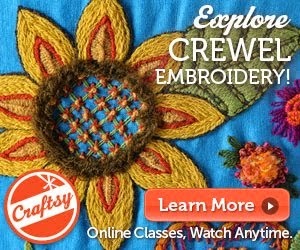 Check it out - she also has a discount code to buy the class (which you keep forever) for $14.99. Abby Glassenberg of While She Naps has a great podcast up with Alicia Paulson and Arianne Foulkes. If you are navigating the waters of an on-line business, this sure is worth a listen. Looking for a stocking stuffer or small gift for a yarn-y friend, check out these Tattly temporary tattoes featuring a cat with a ball of yarn. So cute. You can listen to a podcast with Tattly founder Tina Roth Eisenberg here on the Good Life Project. It's cooking season here in the northern hemisphere. I made this super delicious Moroccan Stew with Raisins, Apricots, and Almonds. I tweaked the recipe from David Lebovitz' new cookbook A Paris Kitchen. 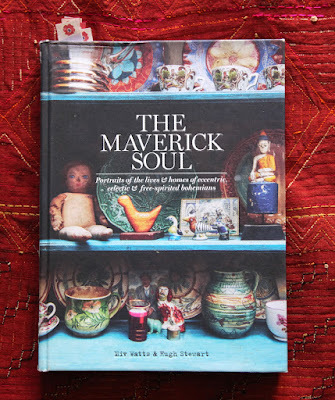 If you are a cookbook person, check this one out. It is a gem. Perfect for bedtime reading. This cookbook is jammed with fun info about Paris and more. David is a great storyteller. Beautiful recipes too. I borrowed it from our local library and have it on my Christmas wishlist! 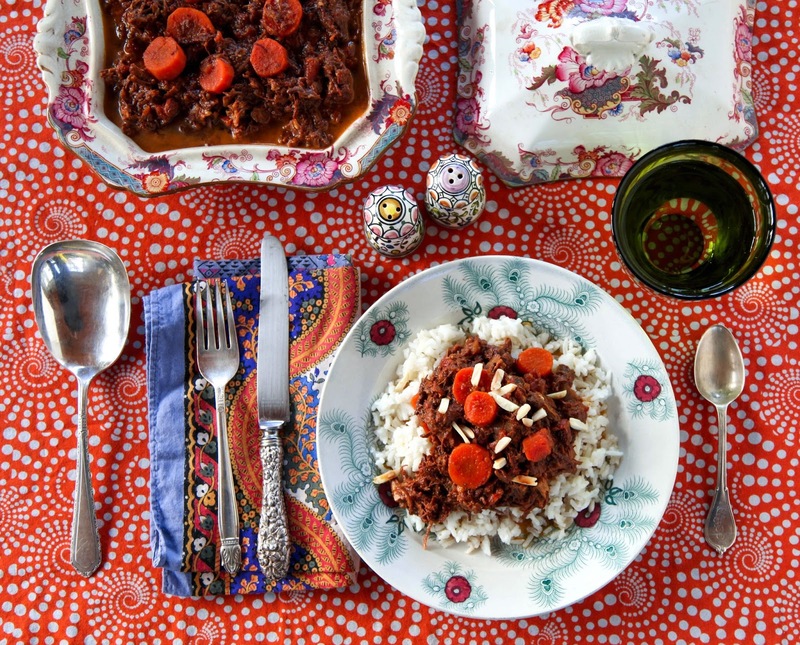 This is an easy to make Moroccan style stew adapted from *David Lebovitz' My Paris Kitchen. Moroccan stews are usually called tagines and are traditionally cooked in a special ceramic vessel. I have Americanized this recipe by using a dutch oven. You can also use a slow cooker. I like to make this stew on Sunday mornings so that the house is filled with the lovely aromas all day long. This recipe in particular smells so good - cumin, coriander, paprika, cinnamon, saffron and ginger combined with the aroma of lamb will make you feel warm inside. It will taste better the second, third and fourth days as the spices have a chance to meld. Omit the cayenne if you are serving children. The saffron is a bit of a splurge but you only need a pinch to add the lovely flavor. Moroccan Lamb Stew is a great supper for the middle of the week - cook up a little basmati rice, warm up the stew and you are ready to eat! 1. Peel and chop the onion. Peel and mince the garlic. Heat olive oil in dutch oven. Cook the onion and garlic until the onions are translucent. 2. Rub the lamb with salt. Brown the meat on all sides in the pan with the cooked onions. Remove the lamb and set aside. 3. Mix the ground cumin, ground coriander, paprika, cinnamon, black pepper, ground ginger, ground turmeric, and cayenne pepper in a small bowl. Add it to the cooked onions in the dutch oven. Cook for a couple minutes until the spices start to smell good. 4. Add the water, the saffron, and the tomatoes and bring to a boil. Stir so it is all mixed nicely. 5. Add the browned lamb to the dutch oven and cover with a lid. Add some more water if necessary - the lamb should be half submerged. Place in a 250 oven and cook for 4 hours. Half way through, flip the lamb over. 6. Chop the apricots into pieces about 1/2". Remove stew from oven. Add the apricots and raisins to the stew. 7. Peel the carrots and chop into 1/4" slices. Add to the stew. 8. Return the dutch oven to the oven for another hour or so until the carrots are cooked through and the lamb pulls easily off the bones. Alternately, finish it on top of the stove by simmering. The apricots will dissolve and become part of the sauce. 9. Let the stew cool and place in refrigerator overnite. In the morning, skim the fat that is on the surface. Remove the bones from the shoulders (they should pull out easily). 10. To serve, cook some basmati rice, couscous or small pasta shape. Toast the almonds in a frying pan, taking care not to burn. Heat the stew on top of the stove and serve over the grain. Top with the toasted almonds. I made the lamb stew this weekend and is wonderful! And the aroma wafts through the house. Terrific recipe.